As a bicyclist, your actions right after an accident with a motor vehicle can seriously impact your bicycle accident claim later. Bicycle-car accidents and the moments afterward are incredibly scary, especially if you’ve been injured. So keep your head on straight, don’t accept any blame, and seek medical attention right away if you need it. The rest can wait. If you’re worried about what might happen, a bicycle accident attorney at Russell & Lazarus APC can help. In this article, we’ll tell you what to do at the accident scene and afterward. Note that, under the law, you’re considered a driver, and we’ll refer to you such for the purposes of this article. If you’re severely injured, it’s okay to leave the scene to get medical help. Otherwise, just about the worst mistake you can make after a bike accident is to leave before the police arrive. If you’re gone, the officer on the scene may not be able to identify the at-fault driver, making it difficult to press your bike accident claim later. Worse, you won’t be able to tell your side of the story to the police. An accurate police report is vital for your bicycle accident claim. Get your side of the story on the record. 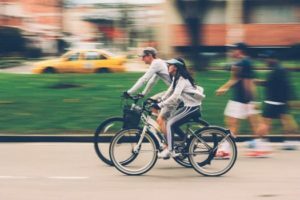 Just as importantly, if you wait for the police to appear, they may ticket the driver, which will make a successful bicycle accident claim more likely. Don’t talk about the accident with the other driver, and never try to negotiate or let them do so. You can’t count on them not to change their story. They may apologize profusely for causing the accident, but apologies don’t pay your bills; so don’t forgive them on the spot, even if you think you’re uninjured. You may be wrong: bruises, crushing injuries, and even broken bones may not become obvious until after the adrenaline wears off. Even if you know you’re injured, you may think an injury is minor when, in fact, its effects may last for years. If the other driver caused your injury, they need to pay for it. Some drivers will accept the blame at the scene, only to reverse themselves later upon receiving legal advice. Others may deny all negligence; later, they may even deny they were at the accident scene altogether. Expect the worst of human behavior when it comes to an at-fault accident of any kind. This may be the most important reason you need a police report. Make sure the police officer takes your account of the accident as well as the other driver’s. Sometimes they don’t bother, but you need to get your version on record. Document any injury you have, even if it seems minor; as mentioned earlier, you never know what will prove to be severe. It you don’t report everything immediately, you may have trouble convincing others a specific injury was caused by the bicycle accident when you make your bicycle accident claim. If you’re unable to make your report at the scene of the accident, or the police refuse to hear you, be sure to get the police report amended later. While you’re at it, collect witness contact information so you can later ask them to support your claim, if necessary. Always obtain the other driver’s contact and insurance information, in as much detail as possible, just in case the police fail to obtain enough information in the report. (This is an exception to the “remain silent” rule). While you’re at it, do your best to photograph the at-fault driver at the scene, including recognizable landmarks in the background, in case they later try to deny they were present. Journal about your physical symptoms. Leave your bicycling equipment in the state it was in after the accident; don’t get it fixed. Put aside the clothing you were wearing and don’t wash it. Don’t send any of this material to anyone other than your own attorney. If you’ve been struck by a motorist in the Newport Beach area while riding your bicycle, be sure to follow the above tips and contact Russell & Lazarus APC. We’ll provide a free consultation and help you decide what to do regarding your claim.